The Pretzel Rods fundraiser is an absolute delight for groups of all types. Salty pretzels, dipped in sweet chocolate and sprinkled with candy, who can resist? 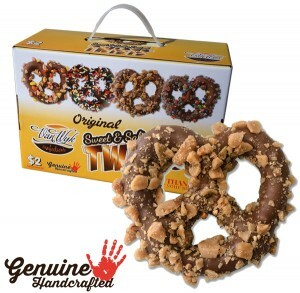 The pretzel rod fundraiser is an excellent alternative to traditional $1 and $2 sellers - the Original $1 pretzel rod Variety pack, and the new $2 Variety pack. If you’ve yet to run a pretzel rod fundraiser, get ready for big smiles and surprising profits! This Original variety pack, offers salty pretzel rods dipped in 4 different toppings – candy coated chocolate chunks, rainbow sprinkles, crunchy toffee and peanut butter candy crunch. 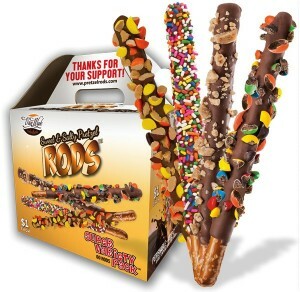 Double your profits with our pretzel twists that are dipped in milk chocolate and rolled in candy toppings. Comes in 4 sweet and salty varieties! Are your supporters looking for a healthier alternative to chocolate fundraising? 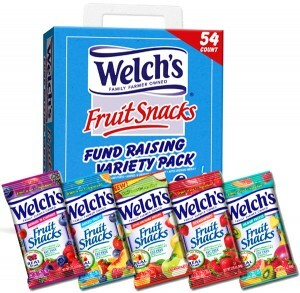 Welch's Fruit Snacks are made with real fruit and real fruit juices. They also contain 100% recommended daily intake of Vitamin C. The variety pack offers an assortment of 5 popular flavors!